Bench Vises are widely used to assist in woodworking and metal working projects. Homeowners have discovered that these devices are very useful and can act like a second set of hands when working with any metal or wood. Good quality vices will hold material securely and will be able to withstand high amounts of pressure while still maintaining its position. Lower quality models do not hold up when pressure is applied. We have selected the best bench vises on the market that will provide you with years of service. 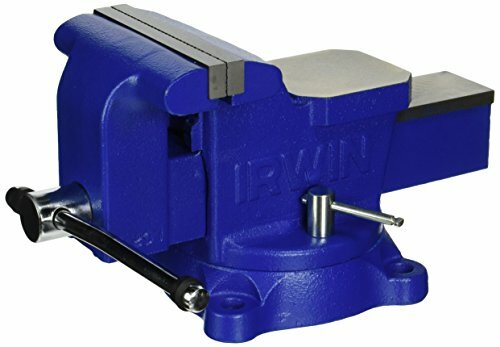 Irwin-226306-6-Inch-Heavy-Workshop is a 6 inch vise that is very heavy duty and made of forged iron. The vise will hold up to 3000 pounds of pressure. This vise is able to handle heavy duty jobs. It comes with a long barrel that is unbreakable. The nut is riveted into the body of the vise for a secure hold. The Irwin-226306-6-Inch-Heavy-Workshop has a safety feature that prevents the slide from separating from the body. This vise is perfect for either wood working or metal working projects. It comes with a swivel base that makes positioning easier and more secure. An anvil is built into the vise with a fused steel handle. The vise has a throat depth of 2 ½ inches and a clamping of up to 4 ¼ inches. The vise comes in jaw depths of 4, 5 or 6 inches. The Grizzly-G7062-Multi-Purpose-5-Inch-Benchvise is a multipurpose tool that will help provide an extra set of hands for your home improvement projects. The vise will hold either wood or metal securely as you assemble or cut based on your needs. The vise base can rotate 360 degrees provided greater positioning of work pieces. It will securely hold both flat and round pieces and will hold both wood and metal up to 4 ¾” wide. The base has the ability to swivel for additional versatility. You can hold pieces either vertically or horizontally depending on the application. 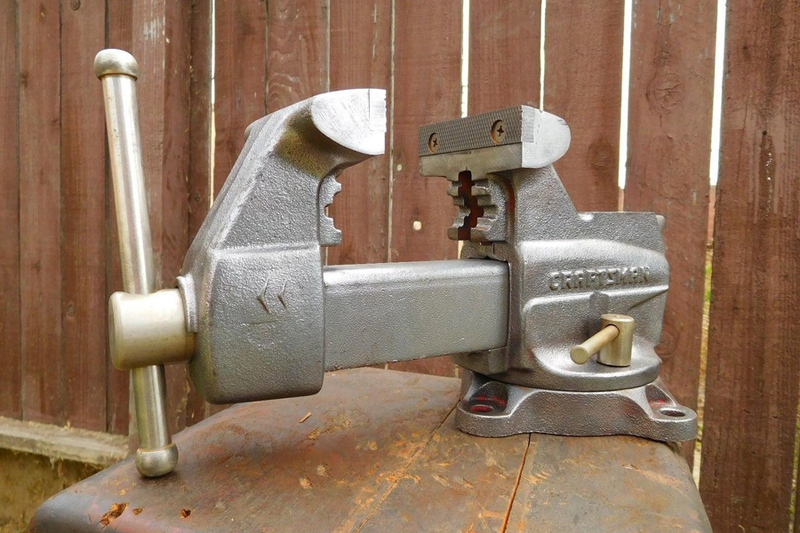 The Grizzly-G7062-Multi-Purpose-5-Inch-Bench vise is a heavy duty vice that weighs 45 pounds. 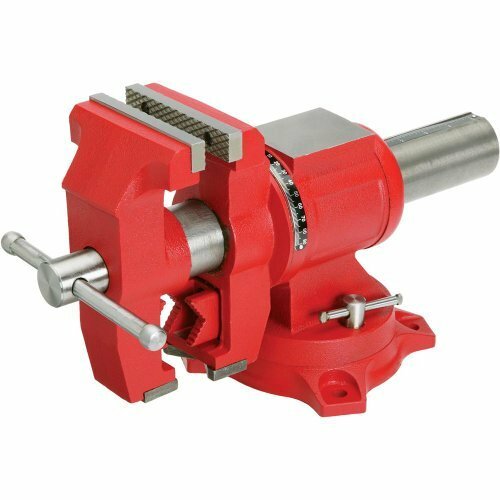 The vice is used for woodworking projects, metal projects, auto mechanics and home improvement projects. The Wilton-11104-Bench vise has a 4 InchOpening and a 4 inch jaw width. 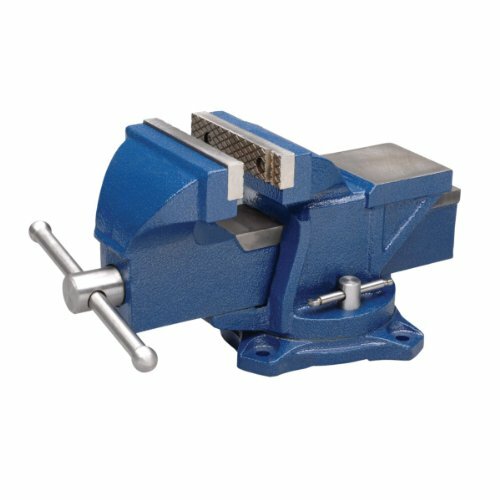 This heavy duty vise is made of heavy gauge steel. It comes with a swivel base that provides better access and allows for more versatility with positioning. The swivel base has a double lock down feature which provides a more stable work surface. The anvil face is very wide and provides a larger than normal work surface. The device is portable and only weighs 15 pounds. This is a good vise for basic home projects. It can help with carpentry, plumbing and any other job that involves wood or piping. It can secure both wood and metal pieces and will hold flat and round items. It also comes with a lifetime warranty.